Although I mostly stick with my go-to peanut butter and banana smoothie, I occasionally am interested in a more summery flavor profile. Typically I concoct one from whatever happens to be my in freezer at the time, which is usually a mixture of bananas, berries, and melons, and maybe a cucumber or two. Blackberries are far and above my favorite berry but as they are quite strong in flavor I like to pair them with something a bit more mild. Bananas are excellent for this, of course, but in late summer peaches are easily my ideal complement. 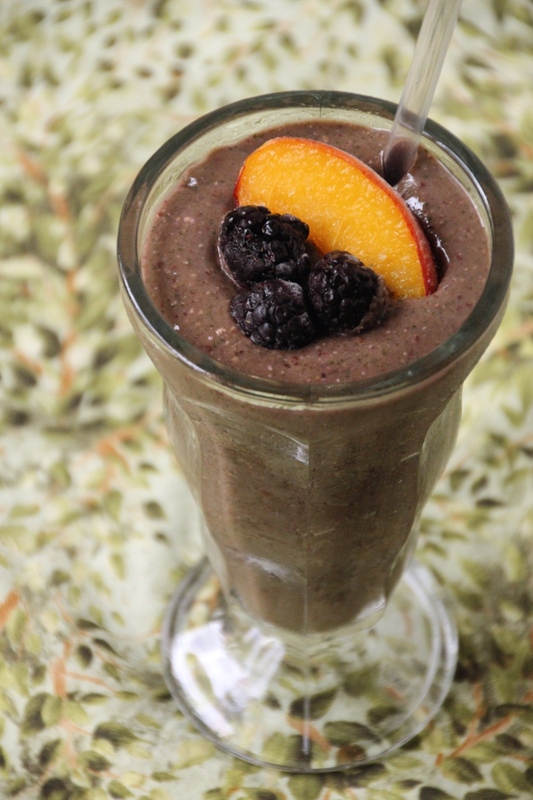 This is another excellent smoothie for any time of day, an equally delicious way to start your day as it is to end it. 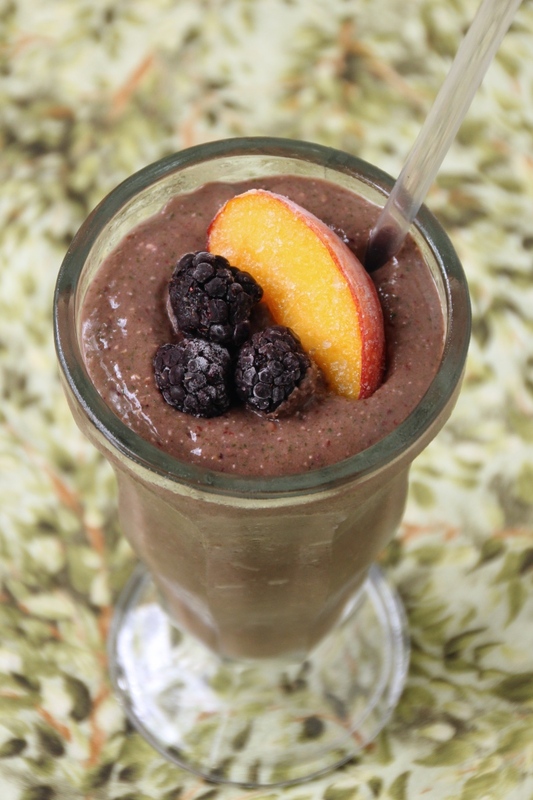 With plenty of fresh fruit and a hidden veggie boost, its flavor is reminiscent of a cobbler but much lower in sugar. The spinach muddies the color a bit, but otherwise it’s not even noticeable. Ground oatmeal makes a nice thickener as well as keeping you fuller longer, and my trusty dash of cinnamon rounds it out nicely. If you prefer yours a bit sweeter, add a dollop of pure maple syrup. It’s not necessary to peel your peaches before freezing them, but make sure they are in small enough chunks to fit in your blender. I typically cut mine into eighths since that’s the easiest way to pit them anyway. Slice and pit a whole tray at once and then arrange on a piece of parchment paper to freeze. Once frozen you can transfer them to a Ziploc or other storage without fear of them sticking into one giant clump of peach. I use this method to freeze all my fruits and veggies for smoothies (and oatmeal) – everything from sliced bananas and berries to cucumber and zucchini. It takes a little prep time, but it’s well worth the convenience later. Sweet peaches and tart blackberries come together in combination perfect for those later days of summer when both are overly abundant. Whether you’re buying from Costco or local stand, or lucky enough to be picking them yourself, it’s a delicious way to use up excess fruits that are maybe a little beyond the raw-eating prime. With these last few weeks of toasty weather ahead, you should have ample time to give this a whirl. 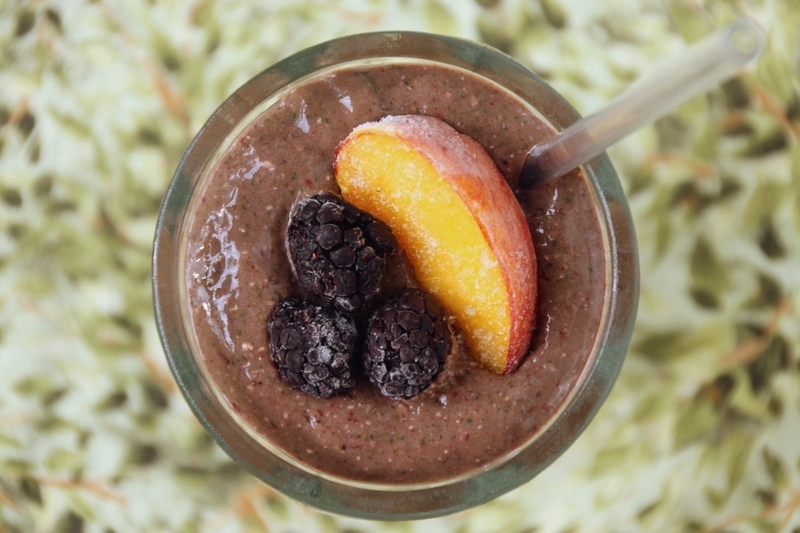 Add remaining ingredients (optionally reserving a peach slice and two berries for garnish) and blend until completely mixed (this could take a minute or so). If it’s too thick, blend in additional milk one tablespoon at a time until desired consistency is reached. 1 I typically slice mine into roughly eighths as they fit into my single-serving blender cup better that way. You can slice yours more or less to suit your needs. 2 I like to put a bunch in the freezer and then crush it all once it’s frozen. Then it’s really easy to measure out a cup or two for each smoothie on the fly. As the days start to get shorter, my thoughts turn to those of fall and how I’m probably not quite ready for that. Fortunately the produce section at Costco is still full of summer flavors. I had a flat of peaches to use up and not enough energy for a pie, so a peach crisp seemed in order. Peaches and cinnamon are one of my favorite flavor combinations and this crisp is no exception. 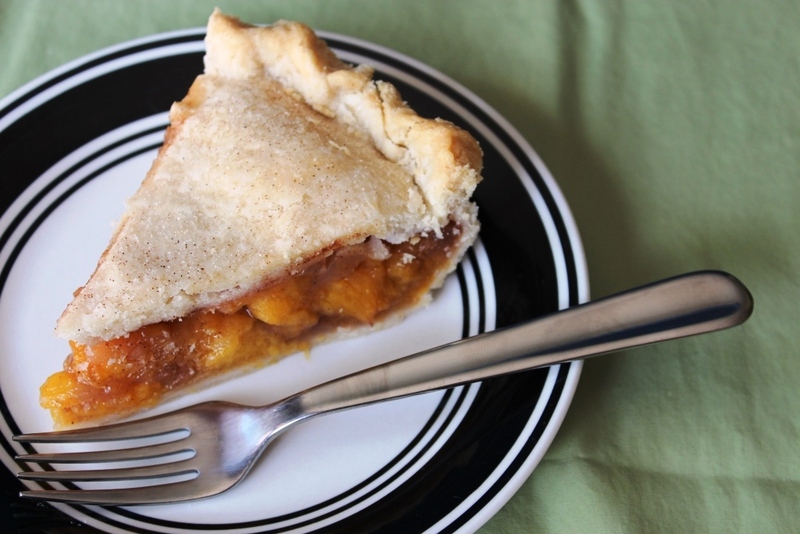 Fresh peaches complimented by ground cinnamon is difficult to beat and nixing the pie crust makes it easier than pie. With the crispy topping it’s great on its own but being as I’m an a la mode kind of girl, I made a batch of ice cream to go with. Obviously vanilla is the traditional choice, but on a whim I kicked it up a notch with a teaspoon of cinnamon. Best idea ever! It’s pairs beautifully with the crisp, and I’m sure it would go great with peach pie, rhubarb pie, or any number of other fruit desserts. It’s also delicious by itself for us cinnamon fanatics. 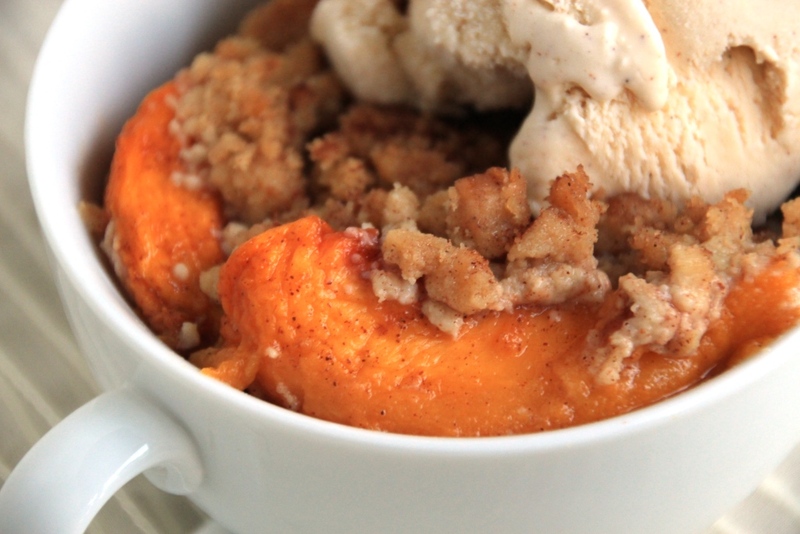 I suggest you make a batch to go with your peach crisp – you’ll be glad you did! Full disclosure: I thought this crisp turned out a little runny, so if I make it again I’ll probably add another 1/2-1 teaspoon of cornstarch to the peaches before baking. If you try it that way, let me know what you think. PS – If you’re cringing at the idea of peeling 6 peaches, check out my peach pie post for an easy and fast way to get it done! Place peaches in a large bowl and gently fold in the sugar. Let stand for about 30 minutes, stirring occasionally. Meanwhile, make the topping: in a small bowl, whisk together brown sugar, flour, baking powder, and salt until well mixed. Add the butter and mix until completely combined and crumbly. You may want to use your hands. Set aside. Whisk together lemon juice, corn starch, cinnamon, and salt in a small bowl. Drain peaches (for at least ten minutes), return to bowl, and stir in lemon juice mixture. Pour peaches into 8″x8″ glass baking dish, crumble topping over the peaches (pressing lightly to make sure it sticks) and bake for about 40 minutes, or until juices are bubbling and topping is crisp. Let cool for 15 minutes, or until ready to eat. 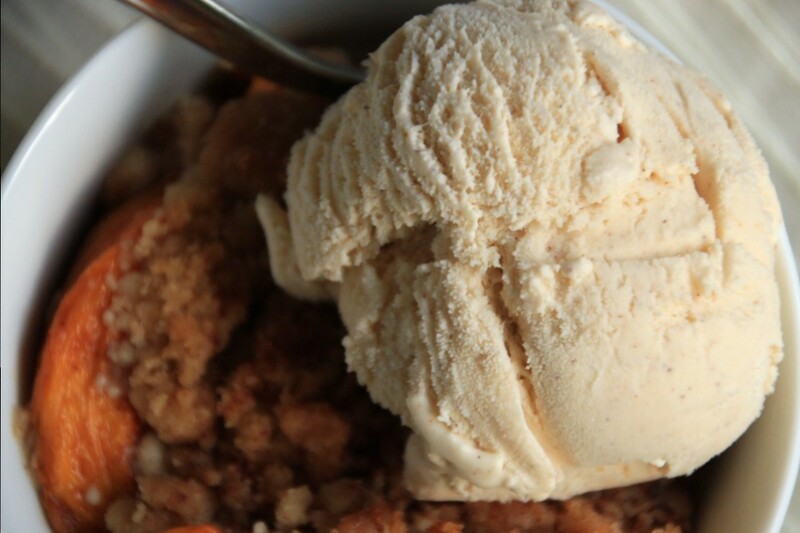 Serve warm with a scoop of cinnamon vanilla ice cream (below). Whisk together all ingredients until completely combined. Freeze according to your ice cream maker’s directions, then place in a freezer-safe bowl to freeze for an extra three hours, or overnight. 1 I love cinnamon so I used the full teaspoon. If you’re not as big of a fan, you’d probably prefer a half teaspoon (or somewhere in between). 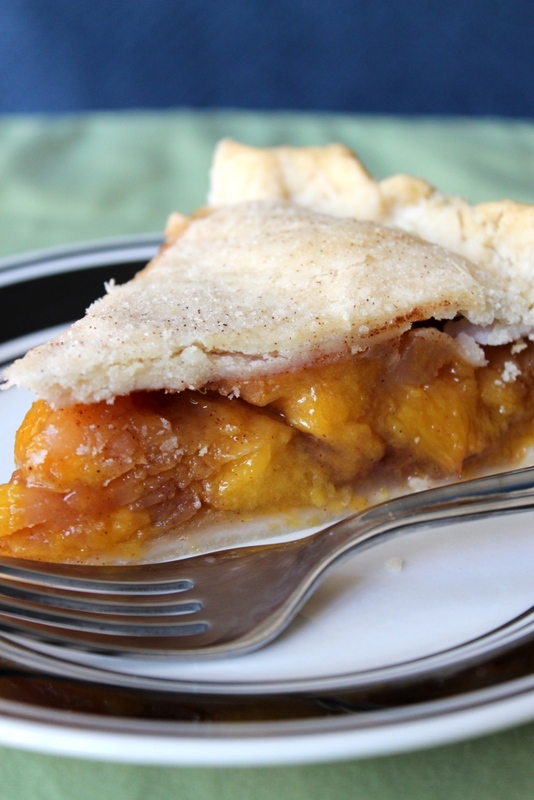 Despite the huge amount of effort involved, peach pie is one of my favorites. It’s a summery flavor that’s delicious all year round, and is a great way to use those large trays of peaches I can’t seem to help buying from Costco. The hint of cinnamon present is always a welcome flavor in my book, and a dash of nutmeg adds a little something. As one of the sweeter pies, it’s definitely a dessert pie to me, but I’d never turn it down for breakfast. Fresh peaches are admittedly a pain to work with, but it’s oh so worth it in the end. If you’re on top of things, peel and slice enough peaches for several pies and freeze them in pie quantities for later use. Just make sure you let them thaw before you use them, and maybe add a little extra flour. Never peeled peaches before? You’re in luck – there’s an easy way! Set a large pot of water to boil (not a rolling boil, more like a strong simmer) on the stove, and place a bowl of ice water nearby. I like to put a colander in the sink as well but that’s up to you. For each peach, submerge in the boiling water for about 30 seconds, then immediately dunk in the ice water for another 20 seconds. With a paring knife, cut the peach (around the pit!) into 8-10 sections. The skin should just slide off the fruit during this process, but if it’s still sticking you can redo the boiling/ice water baths. Keep in mind, however, this will only work if your peaches are ripe enough. Throw the slices in the colander, the skins in the disposal, and the pit in the trash, and you’re good to go! Repeat for all your vast trays of peaches as you revel in how easy it is while wasting no delicious peach. You can definitely take the skin off before slicing the peach, but skinned peaches are ridiculous slippery, so I prefer the extra grip while I hold it. As summer winds down, this is a wonderful pie for a “last hurrah”; saying farewell to summer with fresh peaches, and welcoming fall with that hint of cinnamon. 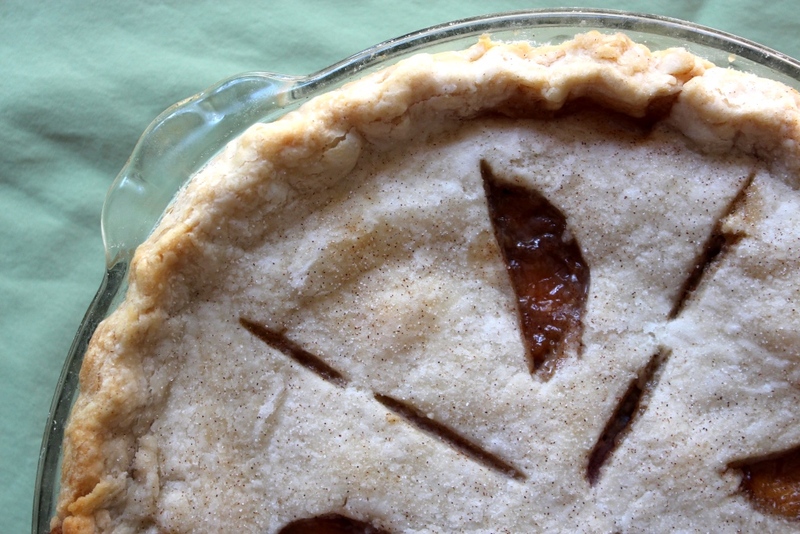 Layer the bottom crust in the pie plate, and trim the edges to 1″ larger than the rim. Gently toss the peaches with the lemon juice, and set aside. Whisk dry ingredients in a large bowl until well combined, and gently fold in the peaches. Layer the peach mixture in the pie plate, and cover with the second crust, either with a lattice top or cutting vents for steam to escape. Seal the edges and crimp as desired. Bake until the crust is golden brown and the juices are bubbling, about 50 minutes. Let cool completely before enjoying with whipped cream, vanilla ice cream, or both.